When Veeam Agent for Microsoft Windows connects to the backup server, Veeam Backup & Replication applies a license to the Veeam Agent. You can view to which Veeam Agents the license is currently applied. In the list of licensed instances, Veeam Backup & Replication displays Veeam Agents that have established a connection with the backup server when you created the backup job. 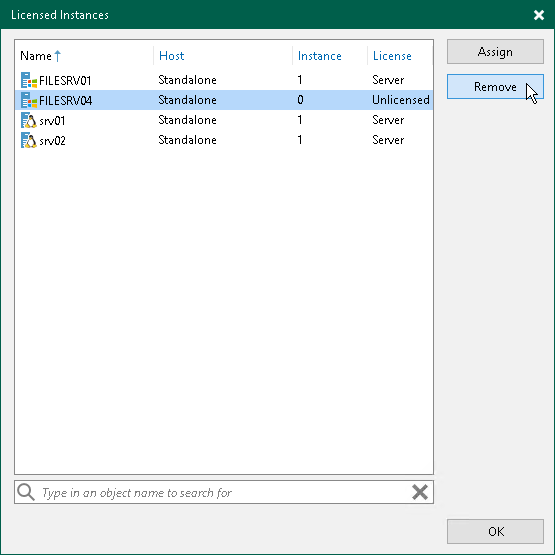 In the Licensed Instances window, select a Veeam Agent and click Revoke. Veeam Backup & Replication will revoke the license from the Veeam Agent, and the license will be freed for other workloads that you want to protect with Veeam Backup & Replication.